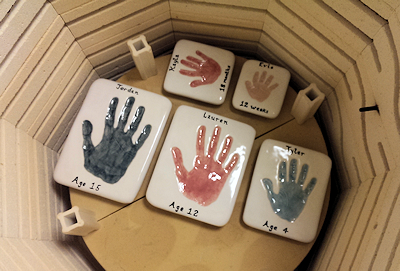 Kiln Time : Hand & Foot Keepsakes : Letterkenny, Co Donegal. We can travel locally to take Imprints. A solution of water & powder(seaweed extract) is mixed to produce the moulding material. This product is widely used by dentists to create dental moulds and is perfectly safe to use on skin. The foot or hand is immersed in the solution to create a detailed mould - this takes approximately 2 minutes to set. The mould sets to a latex like finish,so the hand or foot is easily removed. A plaster casting is then created to produce an exact replica of the hand or foot which highlights all those unique lines & creases. An impression of a hand or foot is taken in soft earthenware clay. A stone plaster casting of the impression is then poured. The end result of the casting gives a 2D effect - the hands or feet are raised out from the tile. 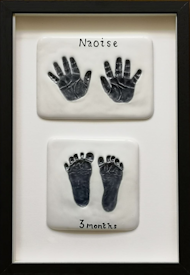 Outprints can be cast for babies, siblings,parents,& grandparents to produce a lasting & treasured keepsake. Impressions of hands or feet are taken in soft earthenware clay - this only takes seconds to do. With children growing up so quickly, the impressions capture a moment in time. However, there is no age limit - impressions can be taken from babies and grandparents alike. Once the clay is dried and shaped, it is fired slowly in a kiln to produce a solid bisque tile. The tile is glazed by hand - white outside the hand/foot and with a colour of your choice inside the hand/foot. Your choice of wording is then painted by hand on the tile to complete a timeless cherished memento. Finally, the tile receives a glaze firing in the kiln to produce a unique glazed ceramic imprint which will stand the test of time. What you receive is the original impression taken, now in ceramic form. Tile dried, shaped and slowly fired. Gift vouchers can be purchased for any amount or for a specific set. The ideal and timeless gift for christenings or any special occasion. 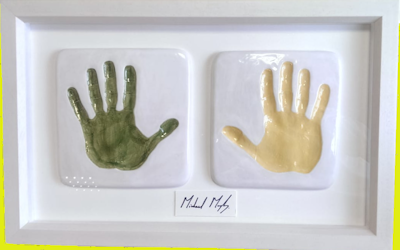 Donegal GAA's Michael Murphy's Hand Imprints for Charity. 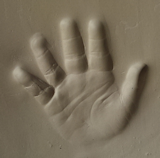 Since the closure of his Letterkenny studio in 2015, Mícheál has concentrated solely on creating Ceramic Imprints of hands and feet. In 2018, he broadened the product range to include 3D Castings and 2D Outprints - lasting keepsakes to be treasured forever. He provides the service from his home studio in Letterkenny. Home or group bookings can be arranged for those living further afield. 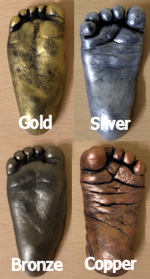 There is a choice of Gold, Silver, Bronze and Copper to choose from. 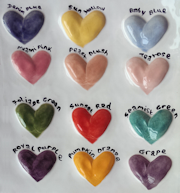 There is a choice of 12 vibrant colours to choose from. 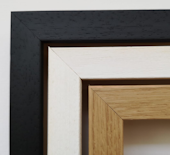 Each set is professionally mounted in a bespoke wooden frame - there are 3 styles to choose from : Whitewash, Black and Natural Wood. All casting, outprints and imprints are crafted by hand from start to finish, so completion time is usually approximately 5 weeks. Final product is amazing and the attention to detail is second to none. Couldn’t recommend this service enough. Absolute pleasure to deal with!! This has been my second visit with Micheal, and yet again just delighted with our prints. Even with a very reluctant wee man to deal with, Micheal still managed to get the job done. Thanks so much for your patience Micheal it was much appreciated and just soo happy with the result. Absolutely love the finished frame. Great keepsake in years to come. Thanks to Micheal for a very professional and accommodating service. Collected my imprints today of my 5 children. Wow, they are beautiful. Such high quality, I am delighted. Would highly recommend Michael, such a talent and lovely to deal with. 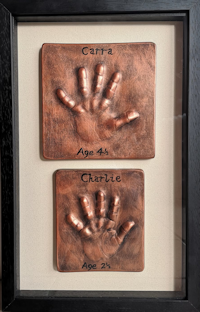 I collected my kids handprints today and I absolutely love them. They are beautifully displayed in a lovely frame. Would definitely recommend getting them done, just wish I did it sooner. Thanks again. Hand prints ready today and they are amazing. Thanks again Michael! !